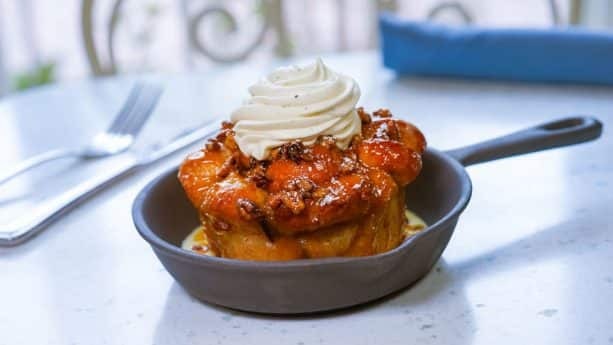 This August I’ve got some delicious new bites on both coasts to share with you, and first up is some exciting news coming straight from Disneyland Resort – River Belle Terrace in Disneyland park is now serving breakfast! If you’re looking for a bit of down-home southern breakfast cooking, then River Belle Terrace is the perfect place to start your day. Take a seat in the shady terrace and choose from a selection of delicious morning dishes like Monkey Bread! Made with warm and buttery sweet bread, this southern skillet dish comes with pecan butter, candied pecans, and powdered sugar. 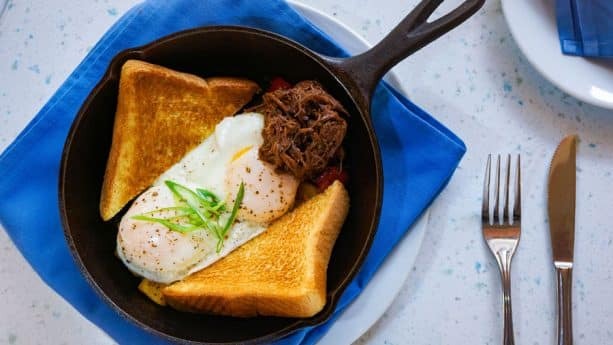 You can also enjoy dishes like the Country Biscuits and Gravy, Becky Thatcher’s Fried Green Tomato, or even Short Rib Skillet with sunny side-up eggs, signature potatoes, onions and peppers, and Texas toast. Oh, and I can’t forget about the MICKEY PANCAKES! 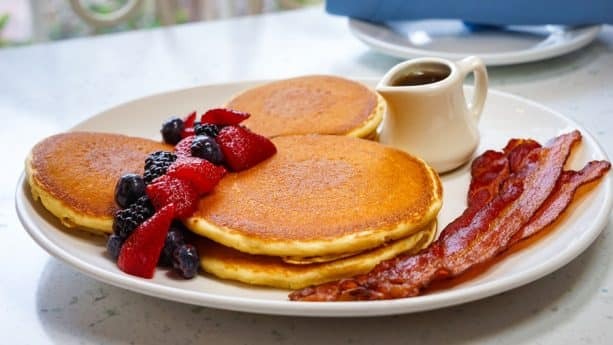 These Mickey-shaped pancakes come with maple syrup, whipped butter, seasonal berries, and chicken sausage or Applewood smoked bacon. Seating for this new breakfast at River Belle Terrace is available on a first-come first-serve basis. Reservations are also available for lunch and dinner only. To see the full menu and book reservations, visit the Disneyland Resort website or call (714) 781-DINE (714 781-3463). 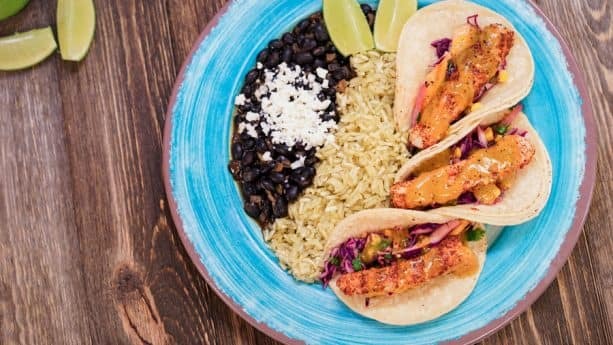 There’s also a new Fish Taco Plate over at Disney California Adventure Park – just stop by Cocina Cucamonga Mexican Grill on the Pacific Wharf to get it! It comes with corn tortillas, citrus cabbage slaw, mango habanero sauce, cilantro-lime rice, and black beans. At Walt Disney World Resort, a new month means new monthly bites at Magic Kingdom Park! 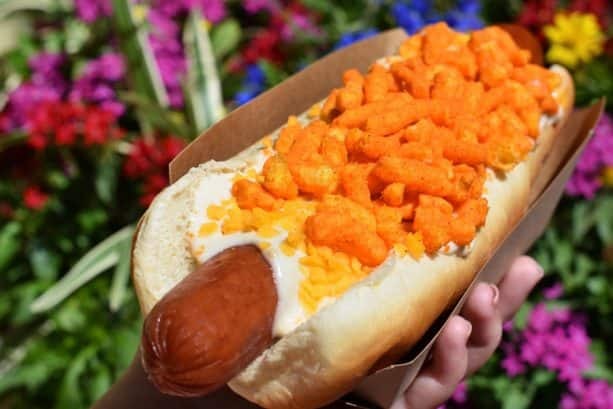 At Casey’s Corner, August’s Hot Diggity Dog of the Month is the Cheesy Dog, an all-beef hot dog topped with queso, cheddar, and seasoned cheese puffs. At Pinocchio Village Haus, the Flatbread of the Month is a delicious Bacon Mac and Cheese Flatbread. 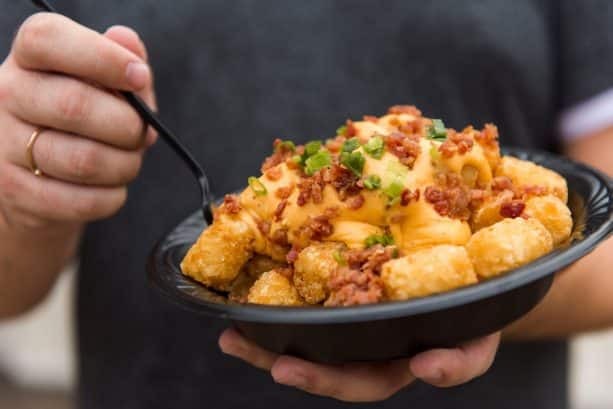 In Fantasyland, The Friar’s Nook is serving Pub Tots topped with beer cheese, bacon, and chives. And if you’re craving a juicy brat, then you can try the Brat and Tots. This bratwurst comes topped with sauerkraut and served with delicious potato barrels. Over at Epcot, there’s a tasty new Stow Away Mary at Refreshment Port. 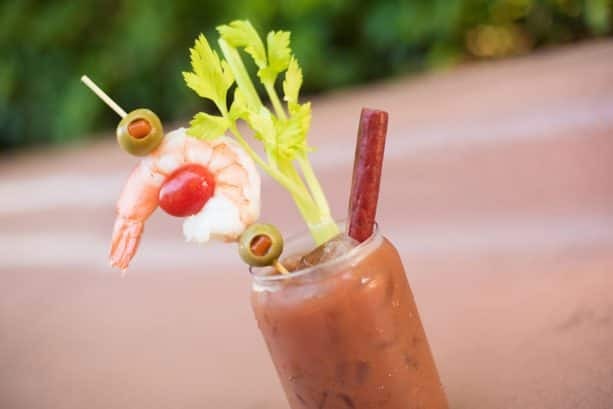 This classic Bloody Mary comes with vodka, garnished with pimento-stuffed olives, a cherry tomato, celery, jumbo shrimp, and smokehouse jerky. Craving some mac and cheese? 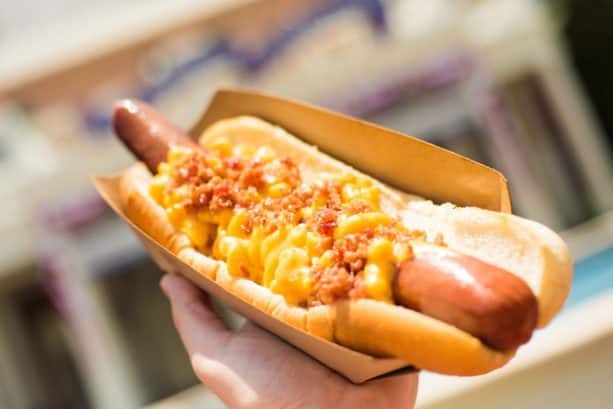 Stop by Liberty Inn at The American Adventure pavilion to try this yummy Macaroni and Cheese All-Beef Foot Long Hot Dog! 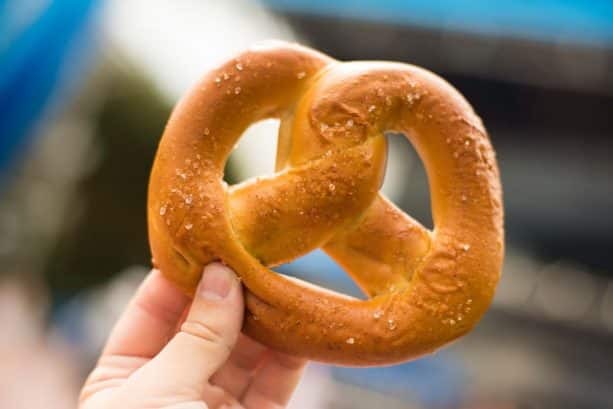 Near Test Track, you can get some fun stuffed pretzels at the Pretzel Cart. Try the Cream Cheese, Jalapeño Cheese, or Salted Caramel Warm Stuffed Pretzels. 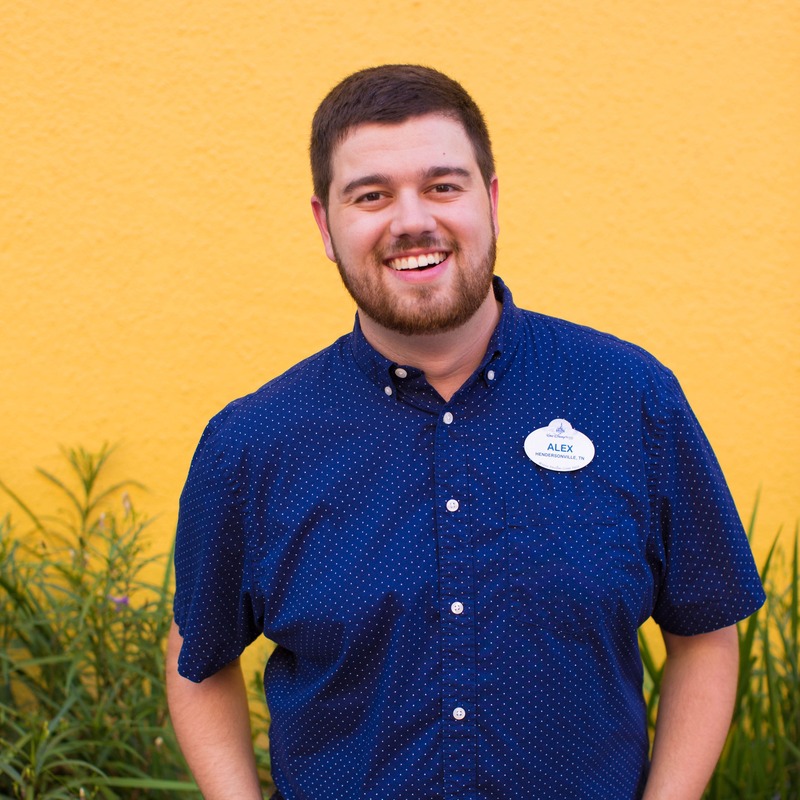 Finally – I’ve got a couple announcements direct from Disney Springs! The first? STK Orlando is now serving lunch 11am-2:30pm Monday-Friday and brunch 11am-3pm Saturday and Sunday! Heirloom Tomato and Burrata Salad, Tuna Tartare and Crispy Rock Shrimp are just a few of the delicious salads and appetizers to start your meal with. You can also enjoy a raw bar with Oysters, Shrimp Cocktails, Ceviché, and Alaskan King Crab. 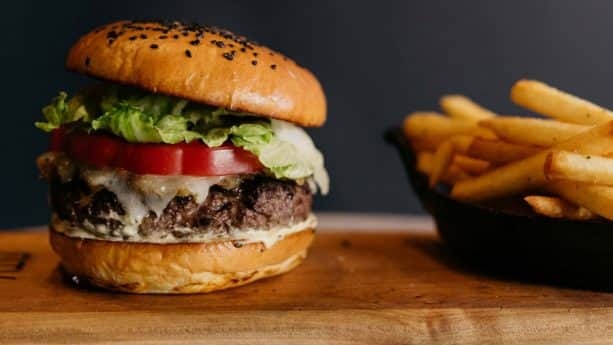 For the main course, you can enjoy steaks, sandwiches, and burgers such as the Linz Angus Burger with American cheese, lettuce, tomato, onion, and chips. And for the sides? Pair your entrée with one of STK’s amazing sides such as the Parmesan Truffle Fries, Lobster Mac and Cheese, or Grilled Trumpet Royale Mushrooms. Another exciting announcement from Disney Springs involves a brand-new food truck! 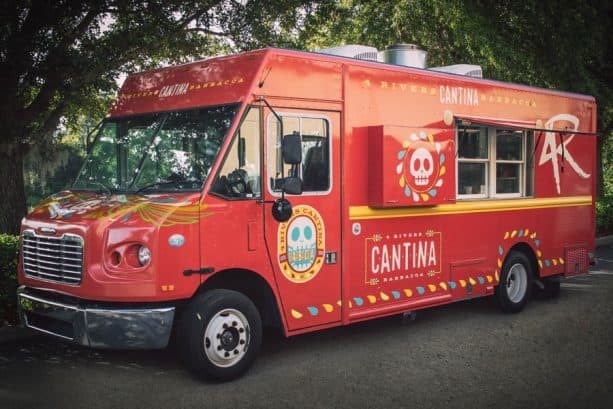 Coming in late August, 4 Rivers is introducing the 4R Cantina Barbacoa Food Truck in the Disney Springs Marketplace. 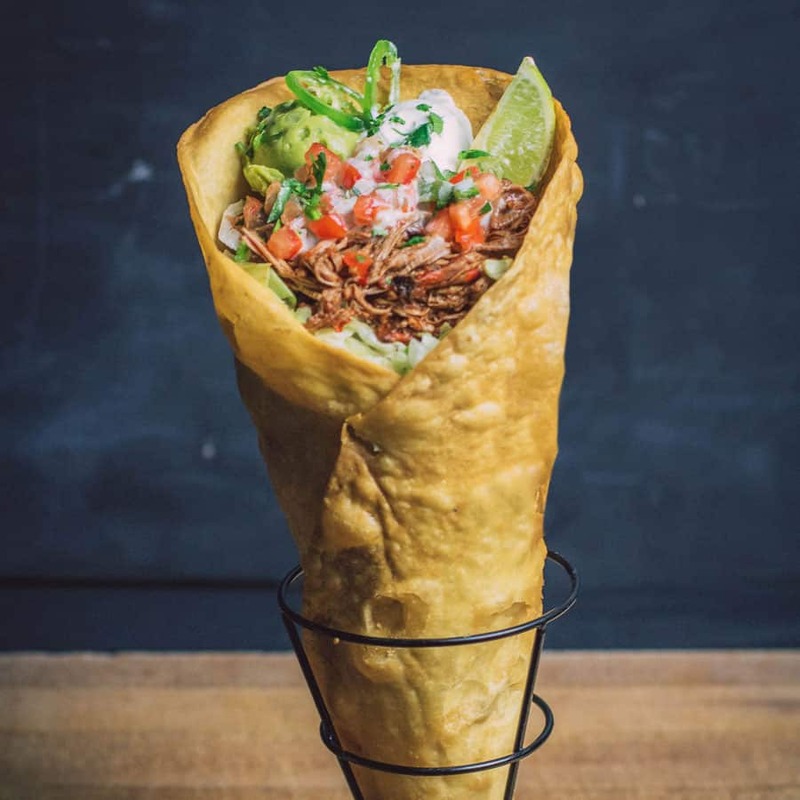 Inspired by the culinary culture of Mexico City, this food truck boasts a barbacoa-style menu with dishes including Taco Cones and Burrito Bowls. These items are filled with signature 4 Rivers meats such as brisket and pulled pork, but prepared using barbacoa techniques. 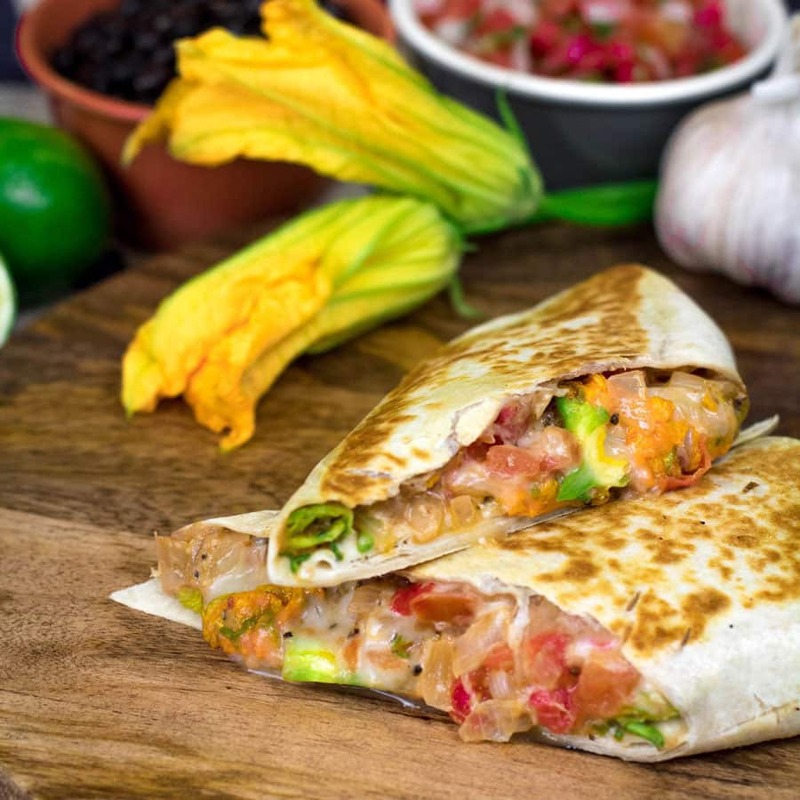 The food truck will also offer standout vegetarian options like the Squash Blossom Burrito. And for dessert, tempt your taste buds with decadent sweets such as the Dulce de Leche Churro Balls! If you’re getting hungry after reading this, then be sure to come on out and try these new bites! To make dining reservations for Disneyland Resort in California, visit the Disneyland Resort website or call (714) 781-DINE (714 781-3463). To make dining reservations for Walt Disney World Resort in Florida, visit the Walt Disney World Resort website or call (407) WDW-DINE (407 939-3463). Please get more vegan options. So glad to hear breakfast is back at River Belle! After an “Extra Magic Hour” at Disneyland, we would always head to River Belle for breakfast. We liked to think about Walt Disney himself enjoying breakfast there in the park’s early days. We were sad when R/B transitioned to a lunch/dinner only location. Thank you for bringing our favorite breakfast spot back! 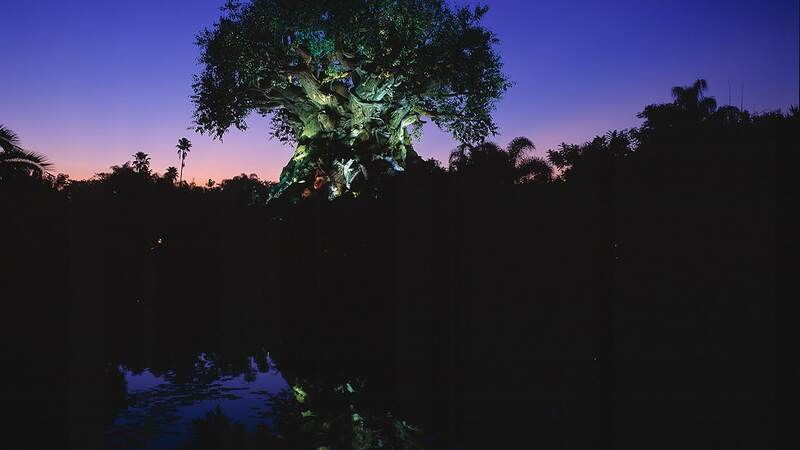 Have a Wild and Tasty Time with New Eats at Disney’s Animal Kingdom!